What Is an Agriturismo in Italy? If you're planning a trip to Italy and looking for accommodations, you'll likely come across the word agriturismo—a combination of the words for "agriculture" and "tourism" in Italian. An agriturismo is a farm stay, or a style of vacationing in farm house resorts. In Italy, many agriturismi (the plural of agriturismo) are generally suitable for the whole family, and many have farm animals with which children can interact. Others are more romantic and perfect for a couples' getaway. Despite the quaint-sounding name, many agriturismo vacations are quite luxurious. Starting in the 1950s and continuing through the 1970s, traditional small-scale farming in Italy became less profitable and many farmers abandoned their farms to search for work in larger towns. However, Italians place great value and worth in their agricultural traditions, especially in the small-scale production of foods like cheese, wine, and olives. By 1985 Italian lawmakers had created a legal definition for Agriturismo, which allowed, and in some cases provided funds for, the rehabilitation and restoration of many abandoned rural buildings and estates. Some were turned into vacation homes, and others were converted into agriturismo accommodations, similar to English or American bed and breakfasts. These agriturismi allowed small farmers to augment any income from the farm by hosting vacationers and providing them with the unique first-hand experience of the rural way of life in Italy. 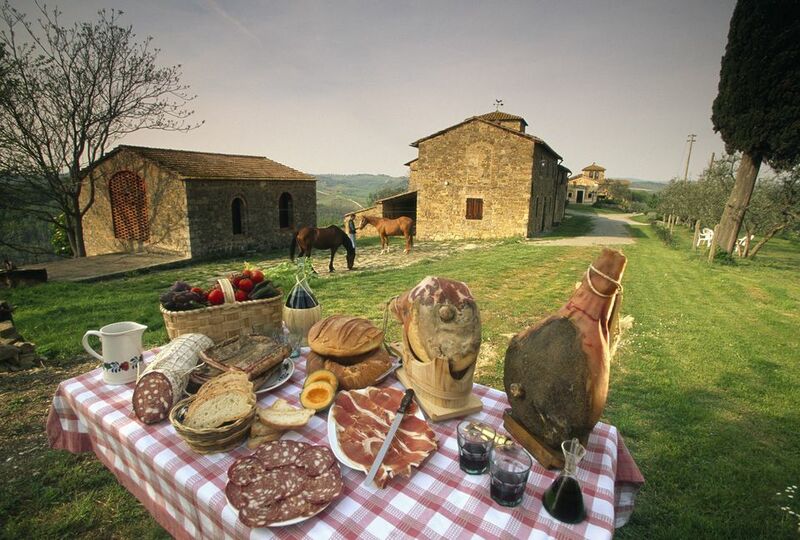 An Italian agriturismo will usually serve guests food that was prepared from raw materials produced on the farm or from other local merchants. Some will allow the guests to participate in the activities surrounding the farm, such as picking the vegetables or milking the cows. Despite the rural nature of the lodging, one might expect a rustic experience; though a great many agriturismi are high-end and feature amenities like swimming pools. Generally speaking, accommodations can run the gamut from simple rooms with rustic furnishings and shared bathrooms to ultra-deluxe suites or apartments with whirlpool bathtubs and other high-end perks. The agritourism bet by the Italian government proved a boon for rural farmers who could no longer rely solely on their farms' output for income. At least a million tourists visit Italy annually to enjoy the scenic countryside in agriturismo lodgings. Although the rural population in Italy has declined since the end of World War II, the agritourism sector has given new life to some areas of the country where there were few other options for new industry. Agritourism is so popular that there are even subcategories of agriturismo accommodation. For those seeking an environmentally-friendly holiday, many farms offer ecotourism alternatives with total immersion in nature. Tourists seeking a little pampering may opt for a wellness agritourism experience at a farm that offers spa services and treatments. Prefer to stay active on your vacation? You can choose an agritourism accommodation that includes horseback riding, climbing, swimming, and other sports and activities. And if you're all about the food (and who doesn't want to sample as much authentic Italian food as possible! ), choose a culinary-centric agriturismo with food tastings and tours themed around the cuisine of the area you're visiting. If you are considering an agriturismo, or farm stay, decide what kind of experience you want. An idyllic retreat in the countryside, or a hands-on experience of Italian farm life? You'll find agriturismo listings—they'll sometimes refer to themselves in English as country houses or holiday houses—on most major accommodation booking sites, as well as on the Agriturismo.it website. Wherever you search, be sure to read reviews, study photos and make sure the agriturismo meets your needs. Also consider what cities or towns are nearby—will you want to explore the surrounding area or will you be content to stay on the farm and enjoy a low-key stay? Whatever agriturismo you choose, you're sure to experience an authentic slice of Italian culture and rural life that you won't find in a hotel!